Exterior of Liberty City Police Headquarters in Torrington. 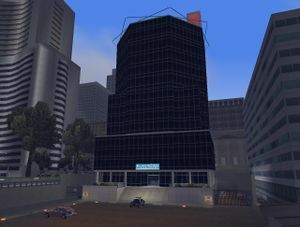 Liberty City Police Headquarters or LCPD Headquarters is the headquarters of the Liberty City Police Department in Grand Theft Auto III, Grand Theft Auto Advance and Grand Theft Auto: Liberty City Stories, located in the north of Torrington in Staunton Island, Liberty City. It is a building of some size that serves as the offices of the police in Staunton Island, which is a heliport on top for the landing of police helicopters, but even so is inaccessible to enter. Unlike the police station in Portland and Shoreside Vale, this is much higher and luxurious. Aerial view of Liberty City Police Headquarters. The police station has several entries, the first is on the right (according to the map and your location) where you can enter a vehicle or on foot, the second is to the south, which is made by stairs. The third entrance is located to the left which can be accessed via a ramp that is located next to City Hall, which leads directly to the back of the commissary where you can find several police vehicles. 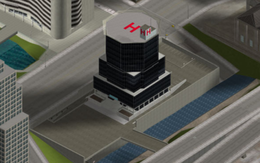 In GTA LCS once and have access to Staunton Island at times appear a helicopter on the helipad of the abyss of this building, because this police station is located in a place dominated by the Yakuza are often see problems between police and gangs. The only role that is highlighted during a mission in the mission Kanbu Bust-out in GTA III, where Claude will have to plant a car bomb in the cells of the Commissioner (in the rear) to free a prisoner. There is a non-solid portion of wall through which the player can enter the building. To reach this, the player has to get to the backside of the station using a police vehicle or a high vehicle like the Rumpo or the Yankee. Then the player has to get to the thin platform, which is on the left. After going a few steps towards the gate, the wall on the right won't be solid and the player can go through. Back offices in GTA LCS. Claude placing the car bomb during Kanbu Bust-out. The car bomb destroying a cell wall at the police station during Kanbu Bust-out. An interior view of one of the holding cells at the Staunton LCPD station. Note the bloodstain on the wall, similar to that of Apartment 3c in Vice City. This page was last modified on 8 July 2013, at 11:37.